If you want to get prickly about it, Porcupine used to be called Golden City, and this is what it looked like back in 1910. 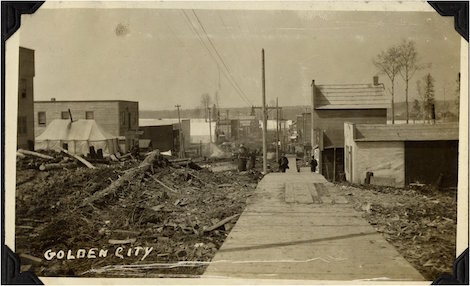 The following is from the Timmins Museum: ************************* View of Golden City (now Porcupine) in 1910. Jun 14, 2015 10:47 AM by: Remember This? If you want to get prickly about it, Porcupine used to be called Golden City, and this is what it looked like back in 1910. View of Golden City (now Porcupine) in 1910. The shot was taken at the top of the hill looking towards the lake (now Highway 101). Each week, the Timmins Museum provides TimminsToday readers with a glimpse of the city’s past. Check out what the museum has to offer at www.timminsmuseum.ca, and look for more Remember This? columns here.